Mathematics is not always the easiest thing to talk or write about, especially when the audience is not other mathematicians. This doesn’t mean talking about math is impossible though, just that it takes some experience and maybe some tricks. Of course that leaves a very clear question: What are these tricks and how can I get this experience? 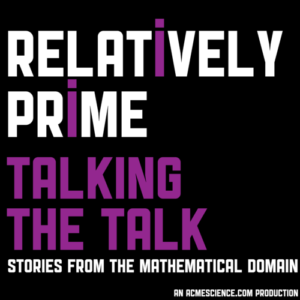 In order to answer just this question Samuel gathered together mathematical communicators Dana Mackenzie, Beth Malmskog, and Colin Adams back in January 2017 at the Joint Mathematics Meetings for the panel “What We Talk About When We Talk About Mathematics”, and in this episode of Relatively Prime you will hear from the panel. Don’t forget to support Relatively Prime on Patreon and make sure Samuel can afford to make rent next month. Plus, you can get access to the RelPrime bonus feed and hear the panel in its entirety.